Every day, we experience sound in our environment, such as the sounds from television and radio, household appliances, and traffic. Normally, these sounds are at safe levels that don’t damage our hearing. But sounds can be harmful when they are too loud, even for a brief time, or when they are both loud and long-lasting. The growing noise pollution problem has many different causes. Booming population growth and the loss of rural land to urban sprawl both play a role. 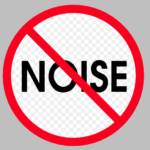 Other causes include the lack of adequate anti-noise regulations in many parts of the world; the electronic nature of our age, which encourages many noisy gadgets; the rising number of vehicles on the roads; and busier airports. In the 1970s, the US Environmental Protection Agency (EPA) set a recommended noise exposure limit of 55 decibels in a 24-hour period, with nighttime noise weighted more heavily because it can interfere with sleep. For comparison, a quiet suburb has a decibel level of about 50, while freeway traffic is closer to 70 and a chain saw is 120 decibels.The U.S. Environmental Protection Agency (EPA) has long identified transportation—passenger vehicles, trains, buses, motorcycles, medium and heavy trucks, and aircraft—as one of the most pervasive outdoor noise sources, estimating in its 1981 Noise Effects Handbook that more than 100 million people in the United States are exposed to noise sources from traffic near their homes. Noise pollution is an often-overlooked source of environmental stress that can raise your risk of serious health conditions, including heart disease. In the US it’s estimated that 100 million people are exposed to unhealthy levels of noise, typically from automobile and aircraft traffic (although everything from leaf blowers and lawnmowers to loud music can also contribute). If you find yourself exposed to noise pollution on a daily basis, we strongly suggest you protect your earing with two way communication Hearing Protection Devices such a dB Blockers. 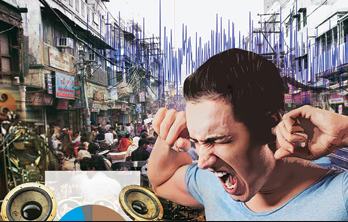 Noise pollution may increase your risk of hearing loss, stress, sleep disturbances, and heart disease. A new analysis conducted an environmental assessment of US noise pollution as a cardiovascular health hazard, and revealed small decreases in noise could add up to major economic savings. The researchers assumed that noise exposure levels in 2013 were the same as those assessed in 1981. However, as urbanization has increased it’s likely these are underestimates and reductions in noise may impact even more people than the study suggested. If you can’t avoid a noisy environment, should you play white noise in order to drown out the rest? White noise is a nondescript background hum, kind of like the noise of a fan or of someone saying “Shhhh!” continuously. Listening to white noise may turn out to be better than listening to intermittent speech if it successfully drowns out the speech, but that doesn’t mean it’s ideal. Learn more about how to protect yourself from noise.